There’s a new poll out by Survation for the Mail on Sunday. The fieldwork was entirely after the government defeat. Survation interviewed 1002 respondents online on Friday afternoon and evening seeking their reactions to the Governmentâ€™s House of Commons defeat over Syria. As we can see there’s been very little movement in VI. 55% said they could not trust Cameronâ€™s judgement over whether Assad was even responsible for recent chemical weapons attacks. I’m not expecting any other polls bar the YouGov for the Sunday Times. I’ll do a fuller round up on that in the morning, hopefully that will have supplementaries on Syria as well as their usual polling supplementaries. Corporeal asks: Was this the best possible political result for David Cameron? Government defeats in House of Commons vote are usually a blow to the sitting Prime Minister, leaving a scar of weakness, and requiring a scramble to reformulate policy to account for the set-back and fill the gap left by the defeated motion. A coalition government adds another level of questions about what this means in terms of unity. In this case however, I wonder if David Cameron will benefit from losing this vote far more than if he’d managed to push it through. For a start military involvement is currently unpopular, really unpopular,the shadow of Afghanistan and Iraq (whether justified comparisons or not) hang heavily over them in the public consciousness. So Cameron has been dragged out of what is currently an unpopular move, but is also immune to criticism from those supporting military intervention. Of course he is still open to criticism from those opposing military intervention, but I’d suggest that criticism for wanting to do something but not actually doing it is the form of criticism that sticks the least. People always focus more on what was done than what was talked about but never happened. He still controls the timetable on the issue; the government’s defeat puts the issue into a siding for the time being with their being no impetus for Cameron to make a move other than declare that he has to respect the will of the house. But at the same time he is always able to put another vote before the house and seek a second vote if he thinks things have shifted to allow him to win it. Had he won the vote, or even if he’d gained near unanimous support in Parliament then the resulting action would still have been owned by Cameron (and to an extent Clegg) much more than Miliband and Labour however much in agreement they were. Owning such an unpopular policy is a case of major political bravery (with the dual implications that term brings). If public opinion (and a majority of MPs) continues to oppose military intervention then Cameron can continue to respect the will of the house and limit the damage he faces from the interventionist stance. If these shift in response to UN reports, news media pictures, or any other factors then he has the ability to go back for a second vote while pointing out it was his position all along. Defeat has forced David Cameron into limbo on Syria, but the flexibility that brings with it means it’s not a bad political position for him to be in. (N.B. This is all obviously a separate calculation to what is best for the Syrian situation and the Syrian people). Itâ€™s unlikely that many of those involved in Thursdayâ€™s debate and vote will look back on their participation with pride.Â Quite why parliament was recalled early when it was due to return next Monday anyway remains unclear, particularly given that the UN inspectorsâ€™ report should be published at the weekend or shortly after.Â The assumption has to be that irreversible steps were planned before next week, probably at the initiative of the US president, whose red line has so clearly been crossed. The defeat of the governmentâ€™s motion is a serious blow to David Cameron and William Hague.Â They have lost their policy, theyâ€™ve lost face domestically and internationally and their word will be treated with more of a proviso by other governments in future.Â That said, other governments have their own parliaments to consider and will be more sympathetic to Cameron’s predicament than some commentators peddling tired analyses based on out-of-date assumptions. On the other hand, they gain some credit by putting the case to parliament before the end-game had been reached, by being relatively open with the evidence and advice, and by listening to the outcome of the vote (which, as it happens, reflects public opinion). Nick Cleggâ€™s position is no better: with the media coverage being dominated by the Cameron-Miliband spat, heâ€™s been airbrushed from the picture.Â Those who noticed will have seen he too was in favour of the defeated government motion, contrary to the views of his partyâ€™s voters â€“ but most simply wonâ€™t have seen him at all. As for Miliband, while nominally the winner of vote, his actions look disreputable and his policy unfathomable.Â Is he in favour of action or not?Â Did he change his mind after giving assurances about what heâ€™d accept?Â If so, why, and by whom?Â His comments immediately after the vote, concentrating not on the implications for Syria or Britainâ€™s forces, but on the PMâ€™s political position make him look petty and partisan. Perhaps the biggest loser is not even in this country but is the US president.Â It was he who set the terms of engagement and now those terms have been met, heâ€™s lost a key ally.Â Congress will have taken note of the UK parliamentâ€™s role in the process and may well demand a say, leaving him swinging. While Obama could proceed anyway, so could Cameron have done in theory; similar dynamics apply, not the least of which is that Obama needs the votes of those senators and congressmen to pass his legislation.Â He will have to take their views into account. There is without question dangerÂ in not doing anything.Â Thereâ€™s a bigger danger still in stating that something will be done, then still doing nothing.Â However, it’s often the case thatÂ the dangers of doing not enough are worse than those of doing nothing.Â Would a limited strike knock out Assadâ€™s chemical capability?Â Would it remove his regime?Â Would it turn the tide of the civil war and if so, to whose benefit? Or would Assad ride it out and claim the victory of survival?Â Would he learn that there was indeed a price to pay for using chemical weapons but that itâ€™s one he can afford?Â What happens when he decides to act on that learning?Â When intervention is unlikely to make things better â€“ and limited air- and missile-strikes wouldnâ€™t â€“ itâ€™s highly probable that theyâ€™ll make things worse. For all that no-one really emerges with credit from Thursdayâ€™s debate, and the defeat of both motions may have been as much down to chance and petulance as design and intent, the right result was reached nonetheless. Looking at those front pages, it doesn’t make for pleasant reading for David Cameron today. Defeat in Thursday nightâ€™s parliamentary voteÂ on the principle of military action in Syria is not an existential wound for David Cameron, whatever his more excitable enemies say. But, after several months of good form, the prime minister looks weaker than at any time since taking office more than three years ago. Failing to win over Liberal Democrat MPs in his coalition government is one thing. Being defied by his own Tories is quite another. Prime ministers are simply not supposed to lose House of Commons votes on major matters of foreign policy. 3)Â Â Â Â Â Michael Gove leadership ambitions, such as they were, took a hit when he yelled â€œYouâ€™re a disgraceâ€ to Tory MPs who voted against the Government. Michael, remember those are the people who are going to vote in the Leadership election youâ€™re planning to stand in. His wifeâ€™s tweets didnâ€™t help the situation either. 4)Â Â Â Â Â William Hague, has seen his odds tumble as next out of the cabinet from 20/1 yesterday to 6/1 now, which makes him the new favourite, a sign of his poor performance in convincing the parliamentary party to back his and the PMâ€™s approach to Syria. Heâ€™s now unlikely to be the next Tory Leader if Dave fell under a bus as I and others have speculated in the past. A few months ago, it was reported that Conservative rebels had the 46 signatures to trigger a vote of no confidence in David Cameron, but were biding their time. For the anti-Cameroon wing of the Tory party, this maybe the optimal time to strike against a weakened Cameron. His authority is diminished, and like virginity, once authority is gone, it is very hard to get it back. The last two Conservative leaders to be deposed, Margaret Thatcher and IDS were both deposed weeks after the Tory Party Conference. Nigel Farage has also had a good non-war. He can point out whilst the other three parties have at various stages not ruled military action, he could gain support from those conservatives who were opposed to military action in Syria, UKIPâ€™s decline in the polls since May could be reversed now. The SNP/Yes to Scottish Independence side could have taken a minor blow as well last night, as theyâ€™ve said in the past, one of the most compelling reasons for Scottish independence isÂ that we will never again have a UK Government take us into an illegal war that we want nothing whatever to do with. For Ed Miliband there are a lot of positives, he has turned the weak meme around 180 degrees and it is David Cameron that now looks weak, and Ed has also helped deal with Labourâ€™s legacy on Iraq. Last night’s vote was a crushing blow to David Cameron’s authority. He’s seriously weakened as a result. But Ed Miliband needs to pray that the Syrian government doesn’t commit any more atrocities. Because David Cameron is going to lay them all at his door from now on. Politicians are at their most vulnerable when they aren’t in control of events, and Ed Miliband is relying on President Assad and the Syrian Government not to commit any more atrocities. That is not the ideal situation for Ed or Labour. But there’s one other thing that needs to be considered,Â we could still partake in military action against Syria…. 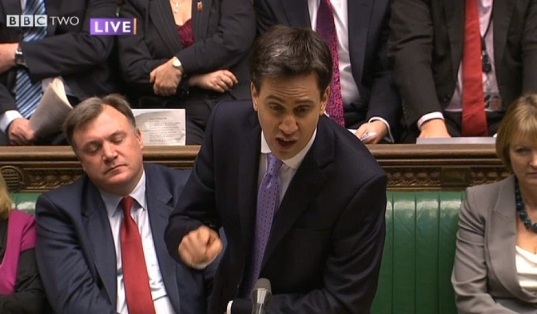 The debate on Syria has highlighted one of the advantages of Ed Milibandâ€™s leadership. As someone who was not even an MP or in the country when the decision to invade Iraq was taken, the Labour leader is able to make policy decisions today free from some of the political shackles of the past. This is far easier for him than his former leadership rivals (with the exception of Diane Abbott).Â Itâ€™s far harder to hit a moving target and Cameronâ€™s attacks on the failures of the war with Iraq would not have troubled the Labour leader. Labourâ€™s current Shadow Cabinet members have had plenty of time to demonstrate new approaches and demonstrate some lessons learned from the late Blair years and the time under Brown. It seems that those Shadow Ministers that have failed to adapt are among those providing Labour the biggest headaches. An opposition leader craves options. Theyâ€™re rarely in charge of events and when they do have an opportunity to respond the last thing they want is for their hand to be limited by cards played by their predecessors.Â Similarly a party that has lost such a large number of votes needs to appear up to date and demonstrably in touch with the mood of the time. Rachel Reeves has been able to push for policies such as a â€˜living wageâ€™ that some of her colleagues refused to implement when they were in office. Itâ€™s not that everything or everyone from Labourâ€™s years in government should be dismissed, but sometimes having someone not clearly confined to the past can make the case for achievements in years gone by. For example Chuka Umunna can arguably make a stronger defence of the difference Labour made to the countryâ€™s infrastructure precisely because he wasnâ€™t a minister at the time and can reflect on what worked and what didnâ€™t. To his credit Douglas Alexander has been one former minister been able to â€˜move onâ€™ and is a better Shadow Foreign Secretary as a result. Positive about the UN in terms of Palestinian rights and on Syria he looks far less like the identikit New Labour minister of years gone by. Maria Eagle has also been able to look afresh at transport policy and make the case for public ownership of rail. Caroline Flint has been nifty on her feet over energy issues and looks like a smart survivor who can adapt. Sadiq Khan as Shadow Justice Secretary has captured the mood Â that shows greater respect to civil liberties which was needed following Labourâ€™s excessively authoritarian approach particularly by its Home Secretaries. To a lesser extent Andy Burnham has been able to defend Labourâ€™s health record but at the same time recognise mistakes such as over-reliance on private finance. Yvette Cooper has frustratingly largely remained a conventional New Labour politician outflanking the Coalition from the right on issues such as immigration but has embraced the fight for womenâ€™s issues and the way theyâ€™ve been hit hardest by cuts. Liam Byrne has demonstrated some sensitivity to welfare issues such as the disabled, and although he has looked out of step with his leader and party on other issues around benefits, he is at least closer to where public opinion is. Ed Balls on the other hand has said and done little that would have been out of place under Blair or Brown. Given the scale of financial crash that has taken place, this is extraordinary. From the height of his Bloomberg speech in the leadership election, thereâ€™s been next to no new fizz or flavour to his pronouncements. Stephen Twigg is also anchored to the past through his uncritical support for academies and the logic of free schools. Other â€˜anchorsâ€™ include Hilary Benn who has said little to set the world alight in terms of local government which given the scale of cuts theyâ€™ve faced and how itâ€™ll have to operate differently is a huge lost opportunity. Ed Miliband wonâ€™t be able to announce a Shadow Cabinet entirely of his own choosing. No leader can. Political balances and alliances in the party have to be respected and reflected. But his job of winning a majority at the next election will be easiest with Shadow Cabinet Members who can demonstrate their ability to move with the times. With less than two years to the election, clearly not all can. Heâ€™ll need to weigh up how many of them are weighing down his partyâ€™s fortunes. Cameron loses Syria war vote; 272 v 285. Perhaps it is time to review these markets, this is not good for Dave, his authority has diminished somewhat. I suspect there is no chance of UK participation in any military intervention in Syria now. It is very rare to have just a single by-election on one day and this ward in South Lakeland (which covers the Lake District) is one of only three councils in Cumbria that hold elections every year (bar county election years). The others Carlisle and Barrow in Furness are Conservative / Labour battlegrounds with South Lakeland being a Conservative / Liberal Democrat battleground and as a result has been doing perhaps a little better than the national average. Back in 2003, when Iain Duncan Smith declared â€œThe quiet man is going to turn up the volumeâ€, the council was hung (Lib Dem 23, Con 18, Lab 9, Ind 2). As we know Iain Duncan Smith was unable to turn the volume up enough and was replaced by Michael Howard. Not that change of leader had much impact on the council in 2004 (Con +2, Lab -1, Lib Dem -1). However, at the general election the following year, the Liberal Democrats sprang a surprise. Westmorland and Lonsdale (for decades a safe Conservative seat) suddenly switched to the Liberal Democrats and saw the election of Tim Farron as the MP (the first Liberal to represent a Cumbrian seat since at least the First World War). The effect on the local Liberal Democrats was barnstorming as in the 2006 local elections they made a staggering nine gains (six from Labour, two from the Conservatives and one from the Independents) and gained control of the council (adding to their tally of Pendle, Stockport and Liverpool in the north west of England). In 2007, they increased their majority to 16 (as well as adding Rochdale to their list of north western councils) and in 2008 reached the dizzying heights of a majority of 21 (and gained Burnley at the same time). After a break for the 2009 county elections, it was all noses back to the grindstone for the 2010 general and local elections and whilst the general election saw Mr. Farronâ€™s majority skyrocket (and make Westmorland a safe Lib Dem seat) and the council remain Lib Dem, they did suffer two losses. Despite overwhelming opposition to missile strikes in Syria, David Cameron’s personal ratings can give him some comfort. Going forward, I would caution reading too much into polling changes over the next few days and weeks, particularly if they’re sub margin of error, plus if there is Western intervention in Syria, with UK participation, there could be a boost for the Government and David Cameron’s personal ratings, in the past, there have been on occasions short term boosts for the Government and Prime Minister, as nation rallies behind them in a time of war. It could well be, military action begins and continues during the party conference season which starts in just over a fortnight, which has also seen short term poll movements. For me, one of the most interesting aspects of the whole Syria story has been Labour’s approach, which has earned them praise and has earned David Cameron opprobrium. UKIP seem intent on hovering up the anti-war vote. But back to Dave and Ed, Parliament is back at 2.30pm today, and it could be entertaining viewing between those two, judging by the comments reported in the Times last night. Undiplomatic lingo; RT @thetimes â€œNo 10 and the Foreign Office think Miliband is a f****** c*** and a copper-bottomed s***”, a govt source.